Introduction: Thiazolidinediones are a group of synthetic medications used in type 2 diabetes treatment. Among available thiazolidinediones, pioglitazone is gaining increased attention due to its lower cardiovascular risk in type 2 diabetes mellitus sufferers and seems a promising future therapy. Accumulating evidence suggests that diabetic patients may exert bone fractures due to such treatments. Simultaneously, the female population is thought to be at greater risk. Still, the safety outcomes of pioglitazone treatment especially in terms of fractures are questionable and need to be clarified. Methods: We searched MEDLINE, Scopus, PsyInfo, eLIBRARY.ru electronic databases and clinical trial registries for studies reporting an association between pioglitazone and bone fractures in type 2 diabetes mellitus patients published before Feb 15, 2016. Among 1536 sources that were initially identified, six studies including 3172 patients proved relevant for further analysis. Result: Pooled analysis of the included studies demonstrated that after treatment with pioglitazone patients with type 2 diabetes mellitus had no significant increase in fracture risk [odds ratio (OR): 1.18, 95% confidence interval (CI): 0.82 to 1.71, p=0.38] compared to other antidiabetic drugs or placebo. Additionally, no association was found between the risk of fractures and pioglitazone therapy duration. The gender of the patients involved was not relevant to the risk of fractures, too. Conclusion: Pioglitazone treatment in diabetic patients does not increase the incidence of bone fractures. Moreover, there is no significant association between patients’ fractures, their gender and the period of exposure to pioglitazone. 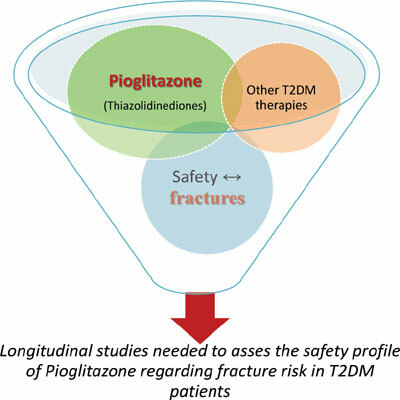 Additional longitudinal studies need to be undertaken to obtain more detailed information on bone fragility and pioglitazone therapy. Keywords: Pioglitazone, fractures, thiazolidinediones, type 2 diabetes mellitus, bone fragility, metabolic disorder. Keywords:Pioglitazone, fractures, thiazolidinediones, type 2 diabetes mellitus, bone fragility, metabolic disorder. Abstract:Introduction: Thiazolidinediones are a group of synthetic medications used in type 2 diabetes treatment. Among available thiazolidinediones, pioglitazone is gaining increased attention due to its lower cardiovascular risk in type 2 diabetes mellitus sufferers and seems a promising future therapy. Accumulating evidence suggests that diabetic patients may exert bone fractures due to such treatments. Simultaneously, the female population is thought to be at greater risk. Still, the safety outcomes of pioglitazone treatment especially in terms of fractures are questionable and need to be clarified.